We have to inform you that a problem occured when processing your last payment (code: 3132224-M, $789.$63). The receipt is in the attachment. Please study it and contact us. 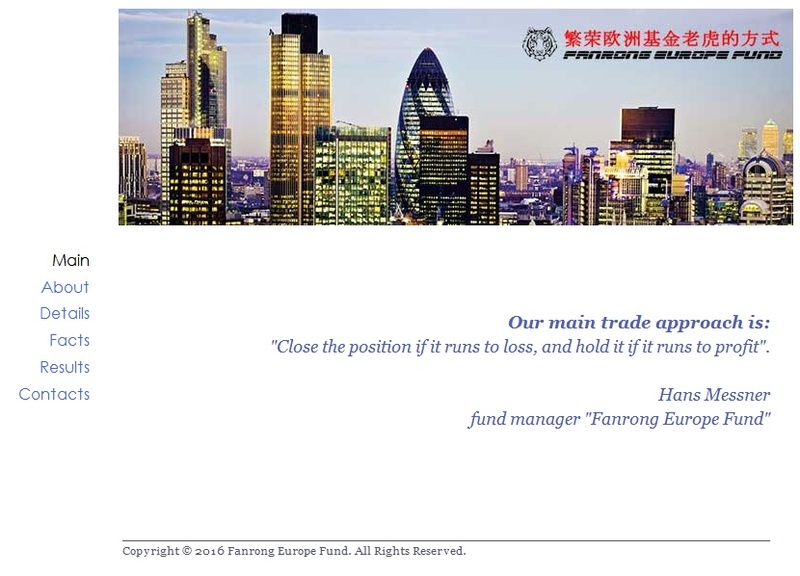 Subject: Fanrong Europe Fund – 1 Half 2016 return +32.69%. 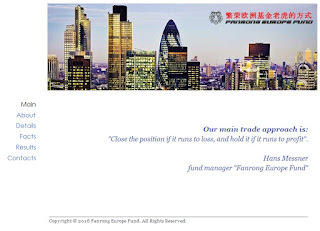 Please be informed that the Fanrong Europe Fund reported strong 1 Half 2016 with return +32.69%. 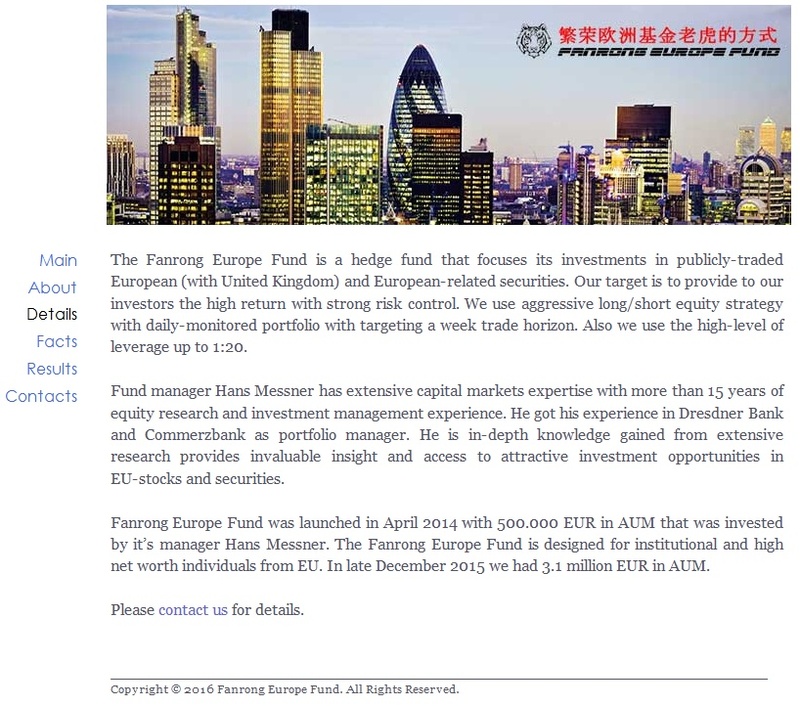 Fanrong Europe Fund is a registered hedge fund that managed by a team of stock market experts that located in Zurich, Switzerland. 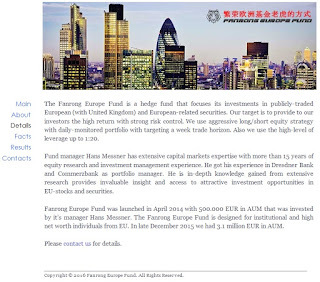 The Fanrong Europe Fund Strategy is Long/Short Equity. 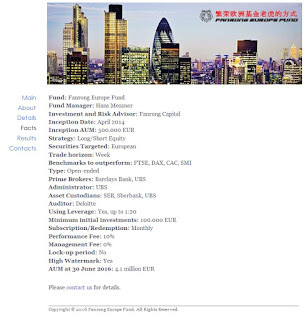 The Fund was launched in April 2014. 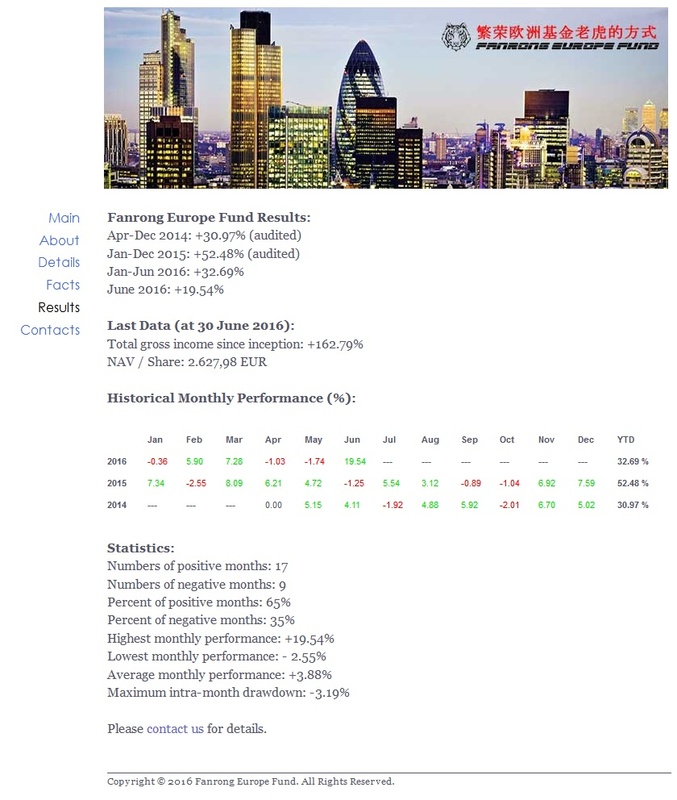 It is open-ended hedge fund. We are open for new investors. NOTICE: Your address was obtained from open sources where you were agreed to receive the marketing information from third parties. The site is hosted (apparently) in the British Virgin Islands on an IP allocated to the Public Domain Registry (PDR). 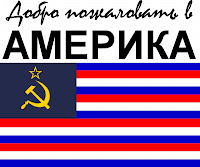 It uses nameservers from Russian company AYBHOST.COM. "Close the position if it runs to loss, and hold it if it runs to profit". 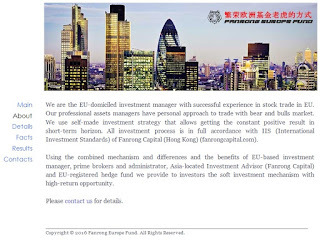 fund manager "Fanrong Europe Fund"
We are the EU-domiciled investment manager with successful experience in stock trade in EU. 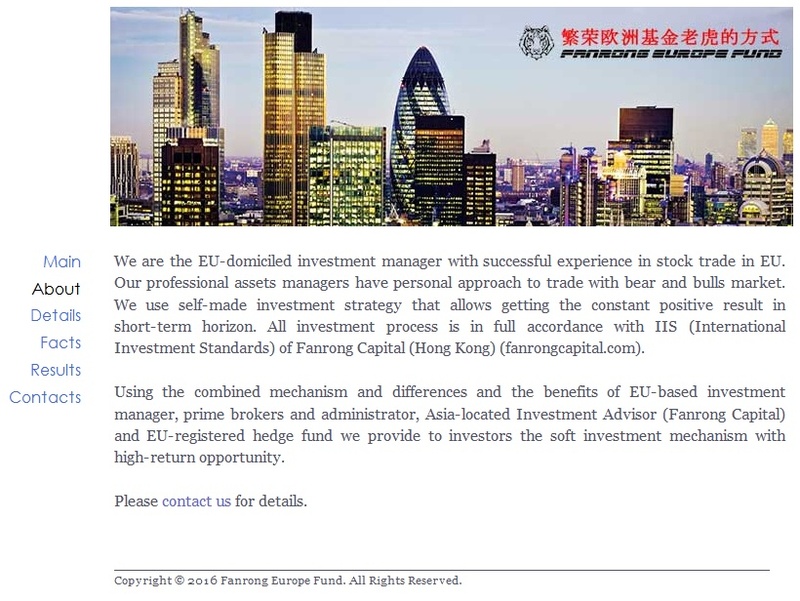 Our professional assets managers have personal approach to trade with bear and bulls market. We use self-made investment strategy that allows getting the constant positive result in short-term horizon. All investment process is in full accordance with IIS (International Investment Standards) of Fanrong Capital (Hong Kong) (fanrongcapital.com). Presumably this is copied off an earlier scam site, in this case there is an official warning about that particular firm. Both of these are hosted on 46.4.24.196 (Hetzner, Germany). The WHOIS details for those are inconsistent with each other. For completeness, the domain fanrongcapital.com is hosted on 5.100.152.26 (the same block as fanrongfund.info) and this particular corporation seems to be using a free email address.. Nothing about this offer is legitimate. 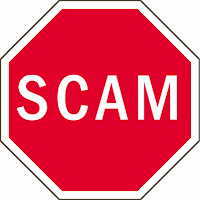 Avoid it, or if you have invested money in this fictitious firm then you should contact the police immediately. 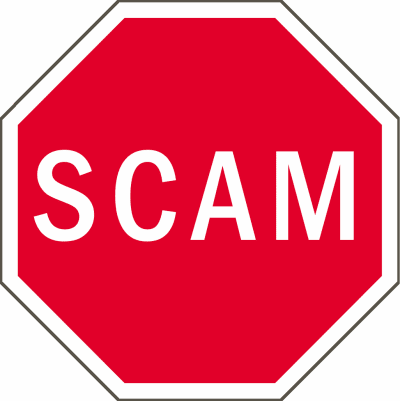 "Anisuma Traders" is the name of a legitimate trading corporation with operations in several African countries, although they are not sending the spam. It looks like a phish, right? Wrong.. The file downloaded is stu.rar which in turn contains an executable milano.exe. I'm going to take a guess and suggest that this is a Very Bad File, although the VirusTotal report give a detection rate of just 1/55 with McAfee flagging it as "BehavesLike.Win32.BackdoorNJRat.gc"
Both the Malwr and Hybrid Analysis reports show that it hooks into the OS and attempts to avoid detection. Crucially, they both show network traffic to gee.duia.eu on 185.19.85.138 (Datawire, Switzerland). So, McAfee thinks this is a RAT and there's suspect network traffic, but what do the email headers tell us? The "X-MDRemoteIP" header shows that the email originates from the same server it is phoning home to. This is unusual because most spam these days come from botnets, and if the originating server gets shut down for spam then the infected clients won't be able to phone home. 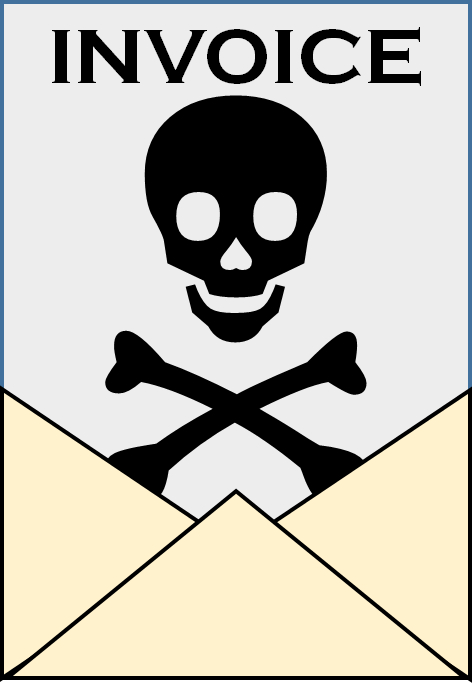 The email routes through servers belong to jackys.com in the UAE, perhaps indicating that someone has altered their systems to allow the malicious traffic to route through. 185.19.85.138 is therefore a server of interest, but a quick look at the IP and the neighbourhood indicate that this isn't just a single popped server.. there are 58 IPs hosting what appears to be malicious data (listed at the end) taking up the entire 185.19.85.128/26 range. I'm betting that renting a /26 slice of Swiss servers isn't cheap. Out of all the malicious domains (listed at the end of the post), one stands out boss.milano22.com (because the binary is named milano.exe). That is related to this malware, but the WHOIS details reveal no clues. Another one that also caught my eye because it is multihomed on so many IPs is zexio.no-ip.biz which is related to this malware from 2012 which is variously identified as Shakblades and/or Blackshades, both illicit RAT tools. 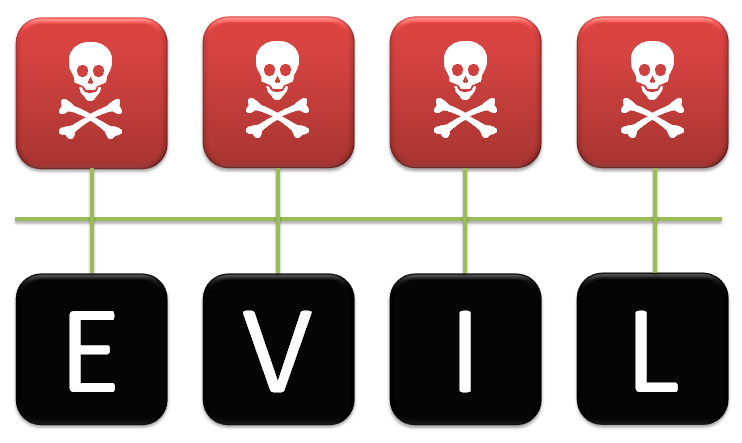 Looking at various other domains shows that they are connected with other malicious activity over the past two years or so. What that means is that this operation is not only big, but has been going on for some time. Malware spam: "Your Remittance Advice COMPANY NAME"
Please find attached a remittance advice (JT934IYIP.doc) for your information. According to this Malwr report it downloads the same Dridex DLL as seen in this spam run plus another variant of the downloader with a detection rate of 3/56. This rather terse spam has no body text and comes from random senders. It has a ZIP attachment which contains a malicious script. Inside is a malicious VBS script. It is likely that there are several different versions, the one working sample I saw looked like this [pastebin] which is very similar to the VBA macro used in this spam run yesterday. Because there are probably several different versions of this script, there are probably several different download locations. In this case, a fake .GIF file is downloaded from a malware server at 193.26.217.202 (Servachok Ltd, Russia) which is actually an .EXE file, but it gets saved as a .CAB file. For no very good reason it is passed through EXPAND which does nothing but save it to %TEMP%\giuguiGIUGdsuf87t6F.exe. It also drops another variant of the same downloader, edg1.exe with a detection rate of 3/56 and a Dridex DLL with a detection rate of 9/56. I hope you are OK. I am writing you to let you know that total amount specified in the contract has been paid into your bank account on the 12th of February at 15:25 via BACS payment system and should reach the destination (beneficiary's) account within 3 working days. To see full payment details please refer to the remittance advice note attached to the letter. Any queries? Please reply back with your questions and you will receive a prompt and qualitative response as soon as possible. 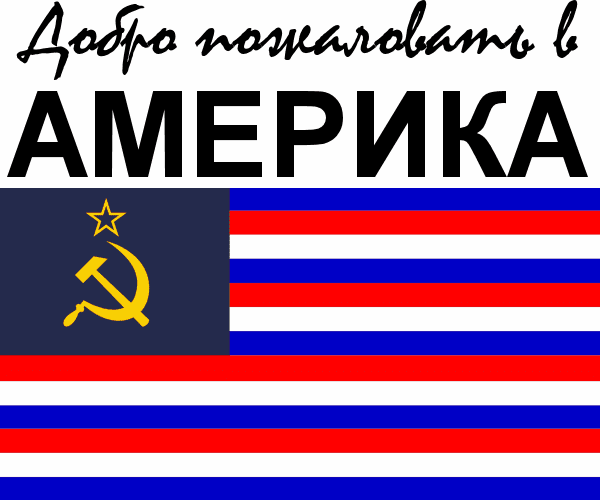 Please do not hesitate to write us. The malware then drops a Dridex DLL with a detection rate of 3/52 and mysteriously drops another Dridex downloader with a detection rate of 6/57. The Malwr report for that indicates there is some attempting traffic to nonexistent domains. Wij willen brengen aan uw bericht dat je hebt fouten gemaakt bij het invullen van de meest recente belastingformulier NAT3799 (ID: 023520). Wij verzoeken u om corrigeer de fouten en verzenden de gecorrigeerd aangifte aan uw belastingadviseur zo snel mogelijk. We want to bring to your notice that you have made mistakes when completing the most recent tax form NAT3799 (ID: 023520). We ask you to correct the error and send the corrected report to your tax advisor as soon as possible.